I was playing Marvel Heroes the other day and chuckling to myself that the Maggia goon I was fighting (that’s right, the Maggia, in no way shape or form associated with or resembling the Mafia) yelled out “Waste ‘dese guys!” to his comrades while firing his dual machine guns at a lone Thor (I guess it’s the royal plural? ), when suddenly I realized that the developers probably chose to use the plural because they assumed that people would be playing this Massively Multiplayer Online game together. The fact is, I play a lot of MMOs, but I almost always play them like a single player game with a chat/trade function. Even when I do partake in the multiplayer aspects of MMOs, I still like to avoid people as much as possible. I like being in a guild, but I get annoyed if they’re too chatty. I like doing group content, but mostly 5- or 6-man dungeons dungeons, not big WoW-style raids or GW2-style open world zergs. I’ve been branching out into PvP, but always in pickup groups. I’m a huge introvert, so this really isn’t a surprise, but of course this begs the obvious question: why play a multiplayer game at all if you’re going to play by yourself 95% of the time? I think it all goes back to my first MMO: RuneScape. I got in to RuneScape because a bunch of my friends were playing it. I still remember my best friend at the time calling me on the phone and saying, as dramatically as possible, and I quote, “I am a part of an online game. And I want you to be a part of it too.” I promptly ran the other way, thinking it was some kind of cult, but warmed up to it when I actually saw it. After about six months, pretty much every one of them had moved on to World of Warcraft. I was, at the time, a high school kid with no income, and I just barely convinced my parents, after much begging, to pay the $5 a month to subscribe to RuneScape, and I knew there was no way I was going to get three times that to play WoW. And, quite frankly, I was happy in RuneScape. So I got used to playing by myself, and not really having anyone to talk to about the new updates, except maybe in an abstract, you’re-an-outsider-who-only-half-understands-what-I’m-talking-about way. The thing is, RuneScape was basically made for this. In RuneScape, you’re in constant competition with other players for resources, and even enemies to farm (the primary way of leveling). Yes, there are a few minigames and such that force you to work together, but for the most part the game can’t really be played in groups efficiently. I played RuneScape for years with no one that I knew in the real world to play with. That trend has, with only a few exceptions, continued ever since. Even when my friends did play the same MMOs as me, I always played a lot more than them, and they ultimately drifted away. And now I think I only know one person who plays any MMO, and he only sporadically. Sometimes I go through phases where I really long for someone to talk with about a given game (actually that’s part of why I started this blog; at least I can talk to the Internet about games, if not my friends), but for the most part I’m happy playing games by myself. The other reason for soloing MMOs is that there’s really nothing else like them in the offline world. Games like Skyrim have the depth and scale, but I’m not a fan of the combat system. Diablo-like ARPGs have similar combat, but generally lack variety as well as good storytelling. Also, MMOs are constantly evolving and adding new content. Aside from the occasional DLC, a single-player game is pretty much static. You can wait 2-5 years for a sequel, or you can wait 2-5 weeks for new content in an MMO. Finally, I think it all goes back to the basic, built-in need for humans to have companionship. Even if I don’t like people chattering or stealing my kills or my resource nodes and wish I could just turn it all off and play by myself, some part of me is still attracted to the social aspect of the game. I get some satisfaction from the contact with other people, how ever fleeting and shallow it may be. 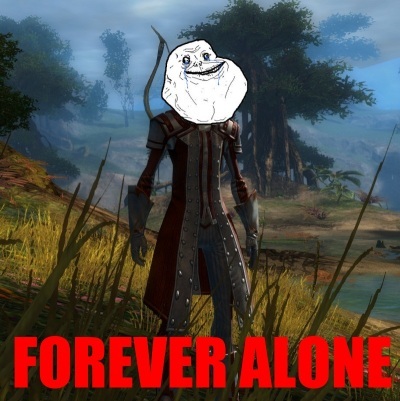 Maybe that’s the biggest appeal of MMOs for an introvert: you get to have social interaction on your own terms. If you want to talk to people, you can, but if you don’t, you can simply hide the chat box, or better yet log out. Is that a good thing or unhealthy? I’m not sure. Probably some of both. I was thinking of Guild Wars 2’s Living Story (new stuff to do that lasts for two weeks or so) and RuneScape (at least when I played it, they added at least one quest per month, usually two). But I feel like most MMOs release at least a patch every month, if not something new to do. Random stranger comment: I just had to say something because this is a lot how I play MMOs. I might be *slightly* more social–if I never ever see any of my friends on, ever, I’ll probably wander away after a while–but I am also perfectly content puttering around in online games by myself, occasionally PUGing or dealing with strangers if needed and running dungeons with friends, otherwise basically soloing. I think of it like when I’m home alone and like to have the TV on for “company.” Fun to find out I’m not the only one who likes to do this!